So I recently raced a deadline on a story I needed to write for an anthology I've been working on in one form or another for the better part of a year. I'd wrapped my edits on all of the contributions of the other authors being featured in said anthology, and I needed to finish my own piece for publication. And then I did what I so often do in January. Guess what? Deadlines don't care. And as much as I complained and moaned and kvetched about the need to work on this story while feeling absolutely as if I had just been run over by a truck (and taking very little in the way of sick time off from my day gig), there was a part of me that would not let go of the writing project, that insisted I get out of the sick bed and work my way through the story. And a weird thing happened. I slogged through a complete draft, and given how lousy I felt, I departed from my standard writing process on it. I usually circle back and revise as I go on a first draft. I re-read, I polish, and then I move on. 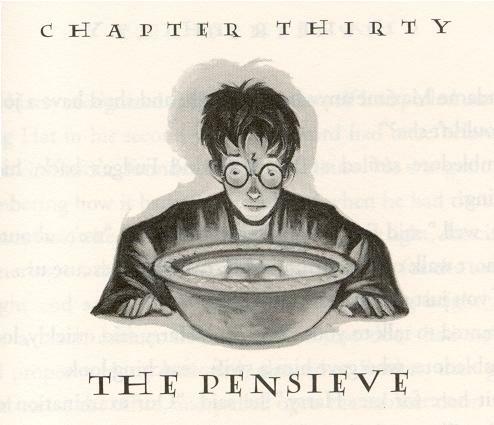 This method, while slow-going, has always done a pretty decent job of keeping my head in the story, or, as I am fond of saying to my Harry Potter-loving wife: "in the Pensieve." I haven't read the books, just love the movies. But the analogy is apt. I've talked about it before, especially here, at some length. Every writer knows what it's like to try to keep one's head in the story during the time it takes to finish the story. It's like dipping your head into the Pensieve, the magical pool in the headmaster's office at Hogwarts where you can skate through the memories of other people. And that's about as poetic and allegorical as I will likely ever get about the act of creating fiction. This time, however, I didn't go back and polish as I wrote. I had an ending and I had a plot. So I wrote the beginning, then the ending, and then I galloped through the middle (so often cursed by struggling writers as "the muddle."). And it worked. What is the secret to staying energized and on track as a writer? 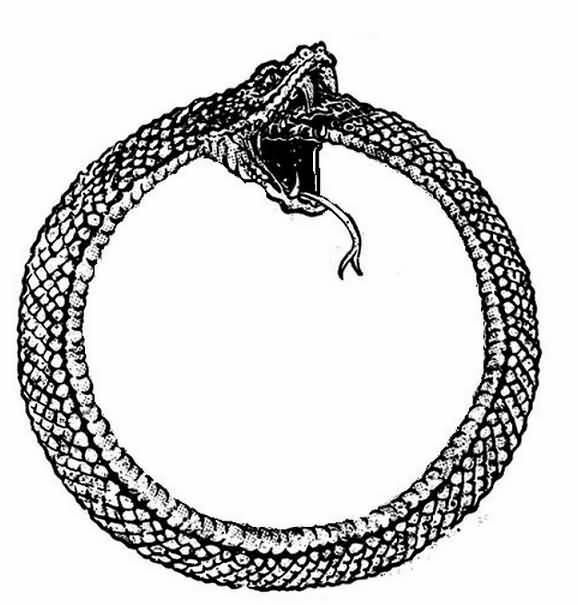 And the answer is: make like an Ouroboros. The earliest known artistic representation of the snake eating itself tail-first: known by the Greeks as the Ouroboros. That's what good writing thrives on. Making like an Ouroboros. I know I just said I jettisoned the part of my writing process where I circled back during first drafts and revised, polished and cleaned up as I went. 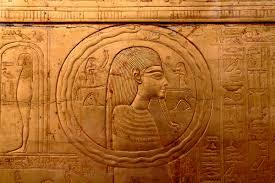 So now I'm saying you ought to make like the ancient snake symbol which completes a circle by swallowing its own tail? Yes. That is precisely what I'm saying. In order to keep your head in the story, you've got to be producing. The power you generate when you're really committed, deeply engaged with the writing progress, can tend to energize, rather than exhaust you. So like the Ouroboros, the creative energy of your writing will tend to feed upon itself, and fuel your next session, and your next, and your next. It can sustain a writer nearly indefinitely, if that writer can figure out how to balance everything else going on in their life, and surf that wave, keep their head in the story, and let the energy created keep pushing them onward toward the finish line. Those of you who get it, get it. And you know exactly what I'm talking about. The toughest part seems to be getting started. The second toughest, once started, is not allowing oneself to ever be completely stopped. In other words, always be working on something. Even if it's writing in your journal (you know, the one you keep where you write about your works in progress. If you don't have one, GET one!). Keep that pump primed and the word count will keep flowing. If I sound pie-in-the-sky optimistic, sue me. I am publishing my first piece of complete fiction for the first time since my son was a year old. And this is a good thing, because I have several projects lined up for the year, and I really can't afford an extended writing drought. And on that note, I've got another deadline to get cranking on. See you in two weeks, when I'll be ready to give details on the one I just sent off to the publisher! Brian - thanks for the advice. I keep getting trapped in the muddle, and I will definitely try making like an Ouroboros! Try to get some rest. You really should read the Harry Potter books & now might be a good time for that. I first got into them by reading out loud to my niece who was five years old at the time. If memory serves, J.K. Rowling wrote the first Harry Potter book first, then the last, then the ones in the muddle! I diagnosed my own case of pneumonia when I came down with it five years ago ... I used to do medical transcription for a living & had transcribed many many charts of patients with nasty stuff bubbling up from the lungs. So when it happened to me, I recognized it as pneumonia. I never found out what the pathogen was. Great advice Brian. Reminds me of the story of how Mickey Spillane had a long bout of writer's block until his accountant called him to tell him his bank account was almost empty. Spillane finished a new novel shortly after. Awesome! I know the prerequisite isn't to get feverishly ill at death's door, but it seems to have triggered the Muses. I suffer terribly from that problem, that of being yanked away and then not getting into the zone again. Worse… like that afflicted British writer, I sometimes forget the brilliant plot. Brian, I learned a tip from children– try Harry Potter audio-books. Not only can you do two things at once (like drive), but it allows the imagination to conjure up the images.